Genevieve served as a research fellow with the Tibetan Center for Human Rights and Democracy. 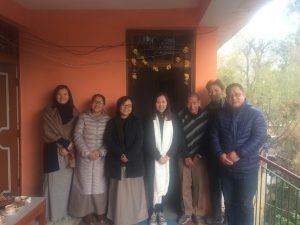 I volunteered as a research fellow with the Tibetan Center for Human Rights and Democracy (TCHRD) for a little over two months in Dharamsala, India. TCHRD’s efforts include reporting, translating, and exposing the human rights violations that are occurring in Tibet. With my education background in International Development, I was fortunate to have the opportunity to support the grassroots NGO that had a great local ownership presence with their staff members consisting primarily of Tibetans-in-exile. While I had an interest and knowledge of Tibet’s situation, I was nevertheless immersed in a topic that introduced many unexplored layers for me. This fellowship gave me the chance to apply my skills of research and writing and do something that I enjoyed as well as learn much more about Tibet. I was grateful to have the full responsibility of researching and writing the 2017 annual report. My activities involved reviewing the reported incidents and events that occurred in Tibet before establishing the main themes that would be included in the report. Once the main themes were finalized, I began my research process that included both primary and secondary research methods. I had the chance to attend conferences and listened to those who had devoted their professional career to study Tibet’s occupation and to speak with experts who were incredibly knowledgeable and insightful. With support and assistance from TCHRD’s staff members, I compiled the major topics and gathered relevant information to present the human rights situation of Tibet in 2017. I felt extremely honored to be welcomed into TCHRD’s office and their community in Dharamsala. From my conversations with staff members, I was able to learn more about Tibetan culture and their experience of being both refugees and as stateless individuals. I will continue to support freedom for Tibet and hope that I can have the opportunity again in the future that would contribute to the Tibetan people and their cause.